Guardianships are a useful legal tool to help people who lack the capacity to make decisions for themselves – such as those suffering from dementia or developmental disability. A guardian can help ensure that the protected person lives with security and dignity to the greatest extent possible given their circumstances. The Aging and Disability Resource Center is a statewide initiative with the intent of serving as a single point of entry into the long-term care system. The Center serves as a “one-stop shop” for access to programs, services, information and assistance. When you or a loved one enters a long-term care facility such as a nursing home, it is important to know you have a full-time advocate in the community who can respond to and investigate complaints. Our ombudsman works to improve the quality of life and care for residents of long-term care facilities. The SMP program provides practical tips and information to help people on Medicare prevent, detect and report Medicare fraud which drains billions of US tax dollars each year. Lost in a sea of health insurance? Looking for information about your Medicare options? The State Health Insurance Assistance Program (SHIP) is here to help! Our Caring Companions program matches volunteers with neighbors who desire services such as meal preparation, housekeeping, gardening, friendly visiting, etc. Are you or a loved one in need of help in coordinating caregiving services such as adult day care or respite care? Our case managers are here to help you develop a plan and arrange for services to be delivered. We deliver nutritious meals to the homebound in Monroe and Owen Counties as well as deliver a bag of groceries once a month to those in need. Patriot Pals provide volunteer support for homebound senior veterans to help achieve their goals of living safely at home and connecting with community. The REPAIRS Team provides services such as installing safety features like ramps, grab bars and rails and repairing windows, doors, and screens. 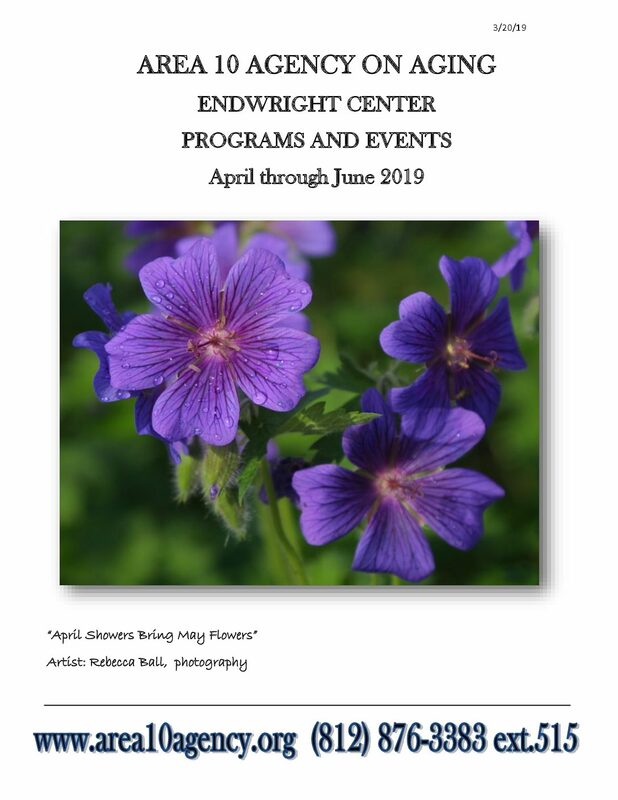 The Endwright Center provides innovative fitness programs, one-on-one computer tutoring, arts and humanities classes, special events, intergenerational activities, support groups, and volunteer opportunities. Come visit us if you are interested in enriching your life with a variety of opportunities. Are you age 55 or better and interested in volunteering in our community? RSVP matches volunteers with local agencies and positions that best complement the volunteers’ unique interests, talents and availabilities. Join our growing community of service-oriented members, and enjoy ongoing support, recognition, free supplemental insurance, and more! Area 10 houses an inventory of new and used home medical equipment and assistive devices, including walkers, wheelchairs, crutches, commodes, canes and more. This durable equipment is available to anyone with a temporary or permanent disability. We offer nutritious meals at group-meal sites and deliver through in-home delivery in Monroe and Owen Counties. We also deliver a bag of groceries once a month to individuals in need. Click the link for more information about each of these programs. Area 10 Agency on Aging provides housing options at three affordable apartment complexes. We are here to support you and provide housing designed around seniors’ needs and interests.